Mario Kart just might be the funnest video game in the entire world. Only the soulless can't find enjoyment in go kart racing with super fast Mushroom speed, red shells and Nintendo characters. So you can imagine the even more ridiculous levels of fun you can have if you turned Mario Kart into a real life race against your friends. That's basically what this is. 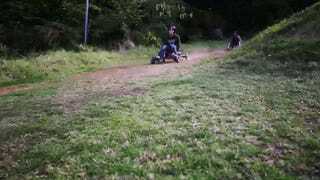 The awesome life havers of DevinSuperTramp and friends filmed this epic downhill grass kart race in Australia in Kurrajong Heights. Even without ever having played Mario Kart, you can find joy in careening down a grass hill trying to beat your friends to the finish line. Man, I want to do this so bad.